Conspiracy Theorists #1: It was blatantly obvious that fight was fixed! Conspiracy Theorists #2: Of course it was! This way, the UFC can make a boatload of money when they arrange Anderson Silva’s rematch with Chris Weidman. Silva entered the Octagon on Saturday night as the UFC’s most decorated champion and MMA’s pound-for-pound king. “The Spider” had more consecutive title defenses with 10 (a UFC record, BTW) than Weidman had professional fights (nine). There was no way Weidman could serve up the upset special. That is unless the UFC had Silva take a dive, which is exactly what happened – so claims Conspiracy Theorists #1, #2 and however many others there are. “Idiots who say the fight was fixed, it happened so fast – and some of you said it, and I was thinking the same thing – ‘What just happened? Was he goofing around? Is he still goofing around when he’s down and he’s getting ready to pull guard? 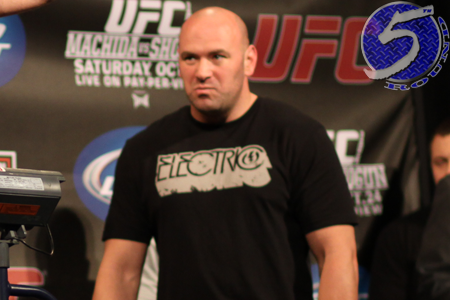 '” White said after UFC 162‘s post-fight press conference. “Then they show that replay and you just see him get clipped and his eyes just roll back into his head. From a betting standpoint, Weidman was only a 2-1 underdog so he wasn’t nearly as heavy of a dark horse as Matt Serra was when he put down a 14-1 odds-on favorite in then- and current welterweight champion Georges St-Pierre at UFC 69. However, given Silva’s lengthy seven-year reign on the middleweight division and how the class had become a tad stale, it was a given the conspiracy theorists would come out in droves when Silva was put to sleep. According to White, a fight’s a fight and anything can happen when that cage door slams shut – even to MMA’s G.O.A.T.